A few musical anomalies have caught my attention lately, as curated on my “Over a Billion Views” thread. It started with Marshmello and the Trap genre, spun toward Lil Nas X (Country Trap), then the K-Pop boy-band sensation BTS. Also on that thread, @Cristina introduced me to a genre called Future Bass. It seems to be a window on the evolving kaleidoscope of ‘contemporary’ music, and in some cases … how that music is even being made. So there’s a philosophic element I am proposing as to “what does this all mean and where is it going?” Not to invoke a crystal ball necessarily, but exploring these trends in relation to where music has been during the era of music recording technology, and what it might look like going (far) forward. As a conversation starter, I had wondered how this viral Lil Nas X track “Old Town Road” had even come about. I can’t say I have learned a great deal, but what I have I’ll share here. The point being that the landscape of music creation keeps shifting with evolving technology and internet savvy, and perhaps is even hyper-focusing on youth culture … presumably since they are newer to and adapt more quickly to these constant shifts. So my example is how Lil Nas X (Montero Lamar Hill, Atlanta GA) came up with this song “Old Town Road” and how it may have been made. It looks like he has just turned 20 years old, so he was 19 when he decided to quit school and be a rap artist. Starting in 2018 (using Soundcloud) is when his music emerged, though he developed a viral Twitter following starting in 2015. 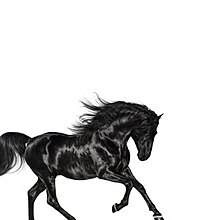 “Old Town Road” was released on Dec 3, not for sale, just released on the internet. Through use in multiple sharing apps and platforms, it eventually went viral. It ended up on the Billboard Country chart (Hot Country Songs, #19) but then controversially got removed for not being “country enough”. Some people scolded Billboard for racism, which was of course denied. It has certainly fed the conversation about the meaning of genre though. In support, Billy Ray Cyrus helped do a remix of the song, adding a few vocal lines (and his celebrity cred). Produced by YoungKio, the song partially samples Nine Inch Nails’ track “34 Ghosts IV” from their sixth studio album Ghosts I–IV (2008). The song prominently features the playing of a banjo and trap drums throughout. YoungKio also appears to be 19 years old, from Netherlands. Lil Nas X downloaded one of his “beats” from either a pay or free site, which contained samples of a NIN song, so both YoungKio and Trent Reznor have been credited as Producers. Here’s where things become less documented, as I haven’t found any information about how the recording or mixing was actually done. I have to presume that Lil Nas X either recorded the vocals himself in a home studio, or had help doing so - either in someone’s home or project studio, or a larger commercial one. I also assume that he basically took the “beat” track and added his vocals (lyrics were written earlier), including backing vocals, and then mixed that as the song. Just guessing really due to the lack of any other background so far. Lil Nas X first released the smash hit “Old Town Road” in December 2018 on the music sharing app, SoundCloud. He labeled the track as “country music” on both SoundCloud and iTunes to increase the song’s visibility when users were searching. But it was really the “Yeehaw Challenge” that helped “Old Town Road” rise to viral status. Taking the line, I got the horses in the back , from the “Old Town Road” song, users of the social video app, TikTok, would upload memes of themselves dressed in cowboy gear and drinking “Yee Yee Juice” with Lil Nas X’s debut tune playing in the background. It’s what the Internet, today, collectively refers to as the “Yeehaw Challenge.” The response to both the challenge and the song was enough to land “Old Town Road” a coveted spot on the Billboard chart. First Lil Nas X teamed up with Billy Ray Cyrus for "Old Town Road," and rumor has it, Beyoncé might be next. I don’t know how much the “beat” cost him, or what other production costs might have gone into making the song, but it looks like a relatively low budget bedroom production went viral on social media, made it to Billboard, and now the guy is practically a household name - signed to Columbia Records - and is working with celebrity status artists (now Beyoncé?). And remember, this all happened in the span of 3-4 months (not counting his pre-existing social media presence and notoriety). And remember, this all happened in the span of 3-4 months (not counting his pre-existing social media presence and notoriety). I don’t think it’s fair not to count his pre-existing fanbase, because it sounds like that play a huge role. Anyway, interesting story. I’d heard the song, but I didn’t know how it had grown to be so popular. Maybe the technologies are new, but is this general story really new? A bunch of elements came together to catapult this guy into success. Doesn’t that happen a lot? Music has never been judged by how much effort went into it–it’s judged for what it is. And that’s a frustrating fact for a lot of artists! One thing that I find kind of funny is EDM “concerts.” These guys are basically standing on a giant stage waving their hands in the air for 2 hours while everyone listens to their records. I guess people go because it’s fun, and to see the producer that they like so much? I guess they try to make it a fun experience with lights and fog and stuff, and maybe it’s enjoyable to be in that large of a crowd. Man, I don’t know, it’s not for me. If I’m going to listen to a record I might as well hear it in the comfort of my own home! Oh also, with this style of music people are always talking about how it’s going to sound on the “dance floor” or “in the club.” I think it’s this whole culture that I’m just not a part of. I think drugs play a role. But I mean, that’s not really new either. Yeah, I think that music will always be evolving in terms of what it sounds like, and in terms of how it’s made. But people don’t change that much, so the general “game” won’t change that much either. It seems to be a window on the evolving kaleidoscope of ‘contemporary’ music, and in some cases … how that music is even being made. So there’s a philosophic element I am proposing as to “what does this all mean and where is it going?” Not to invoke a crystal ball necessarily, but exploring these trends in relation to where music has been during the era of music recording technology, and what it might look like going (far) forward . IMHO, until some true innovations come along either via some exceptional artists, a groundbreaking new technology (think electric guitar) or an unlikely evolution of the musical tastes of consumers (young people) it will look the same as it has for a while now which is going in circles. I’m with Christina on this, there’s nothing new here. But I do applaud you Stan for discussing this and calling our attention to it! I don’t think it’s fair not to count his pre-existing fanbase, because it sounds like that play a huge role. It’s true that part of what I’m calling this ‘new’ phenomenon has a lot to do with social media and a much more interconnected world. Kind of like the old “it’s who you know”, or who knows you. The volume of people one person can connect with all over the world has grown exponentially, so I believe that’s a factor. And I agree, it’s what spread the word once he released the track. Maybe the technologies are new, but is this general story really new? A bunch of elements came together to catapult this guy into success. Doesn’t that happen a lot? I thought about that while I was writing about it. I don’t know if it happens a lot, but it seems like it happens more now, or faster than it used to. The “Future Shock effect” (an old book/movie) seems to make things come faster and faster. Since you bring it up, yes there were numerous incidents in the past that I learned of where a new artist just came out of nowhere and had incredible success. These tended to revolve around record deals signed with a record company rep in a dark parking lot , and an overnight success or one-hit-wonder. Artists or bands that had no fans or following, and didn’t even have experience playing live, could be plucked out of obscurity and made famous if a record company exec ‘believed’ in them. Nowadays, you don’t even need the record company deal as we see in my example … his success on his own actually got him a record deal after the fact. One thing that I find kind of funny is EDM “concerts.” These guys are basically standing on a giant stage waving their hands in the air for 2 hours while everyone listens to their records. I guess people go because it’s fun, and to see the producer that they like so much? It puzzles me too, but I guess it’s the modern equivalent of the Rock concert. People and their friends want to have fun, cut loose, and even be crazy and irrational … so I guess I don’t expect it to make sense. I think drugs play a role. But I mean, that’s not really new either. As Aef mentioned on the other thread, XTC (Ecstacy) and other drugs helped bring about the DJ and EDM culture IMO. Back in my day it was weed and acid. Different drugs, different music. I think that music will always be evolving in terms of what it sounds like, and in terms of how it’s made. But people don’t change that much, so the general “game” won’t change that much either. That’s part of my curiosity, kind of the “sociology of music”. Especially for younger folks IMO. When I was young, my friends and I always talked about the latest bands and songs, and what concerts were ‘hot’. It was a huge thing. I’m trying to not be out-of-touch now, but age and maturation tends to do that. I do applaud you Stan for discussing this and calling our attention to it! Thanks! I find it’s actually gotten me more excited about music in some way. I think I was getting more and more jaded by the direction of music, and especially Pop music these days. While initially I thought the EDM/Trap genre was rehashing the 808 kick and other cliches, it’s at least got me curious and even enjoying some new music. And it’s helping to frame my new/renewed fascination with synths and all the possibilities of sound design and creativity. Now I just need to put it into action. I’m not a fan of EDM but I do listen once in a while and I do like some of it. If you follow it at all you see that these are serious artists who work and study hard like any other serious artist. The concerts feature expensive high quality sound systems that are carefully designed with a specific sound in mind. EDM started with disco and experimenters like Steve Reich and Philip Glass who are a lot more interesting than popular EDM. But I like Giorgio Morodor/Donna Summer stuff like the Red Hot Chili Peppers. If you follow it at all you see that these are serious artists who work and study hard like any other serious artist. Yes, this is one of the big things I’m coming to realize. Initially I thought the music was “simple”, and it wasn’t my intention to disrespect it, just that it sounded simple to my ears and presumably simple to make. I guess I was comparing it to the blood, sweat, and tears of recording traditional instruments, and it seemed like the electronic stuff offers a lot of shortcuts. But I’m learning that there is artistry to it, and learning synths and advanced MIDI do open up levels of complexity that takes time and effort to master. Rather than compare, I’m trying to just appreciated it as ‘different’. The concerts feature expensive high quality sound systems that are carefully designed with a specific sound in mind. Another good point. It’s almost like the music has evolved to exploit the higher quality sound systems available; a symbiosis of sorts. Or the technology that runs it. Ha, that’s wild! When I started getting deep into synths a few months ago, one of the first things I explored was the old Donna Summer song “I Feel Love”. It came to mind as an early futuristic synth sound, and it was a Disco-type song that I actually liked. Come to find out by doing some research that it was THE song that actually launched the full-fledged Disco sound, and the synth-Pop revolution. It’s a wild story, they tried to make all the instrumentation with synths, and nearly succeeded - finally they had to use a real kick drum as they couldn’t replicate the sound. The snare and hi-hat are synth sounds. The Moog synths they were using would get out of tune or sync or something, so they had to keep tweaking them through the recording process. It was the weirdest approach to take, but it surprised everyone and I guess the newness of that particular sound (I think it was manual sequencing, but sequencing nonetheless), the infectious dance groove, and Donna’s vocal performance won the day. I read that Donna initially was very skeptical and didn’t think she could even sing to it! It probably goes to show that the listening public doesn’t care how music is made as long as they enjoy the sound. ??? It is very interesting, but not what I’d call EDM. It actually kind of reminds me of the “Cosmic Jazz” of Andreas Vollenweider, who I admire. It is very interesting, but not what I’d call EDM. Ha, yeah it has no dance kick and it’s not electronic so you are right! But it has the endless short sequences repeated with mechanical precision. And then the modulating phasing effects are electro/mechanical in nature, it’s kind of a cousin of the disco/edm style. This piece debuted in 1976, one month after “I Feel Love” and helped make ‘Minimalism’ popular at the same time as Disco, they kind of influenced each other I guess. 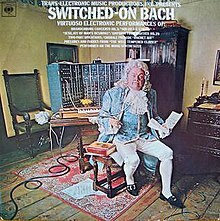 Another important early example of electronic music was “Switched On Bach” from October 1968. It made it to #10 on the Billboard charts and was a big influence on everybody. “Switched On Bach” from October 1968. It made it to #10 on the Billboard charts and was a big influence on everybody. That title sounds very familiar, I know I heard of it back in the 70’s, but all the stuff I found on YouTube doesn’t sound familiar. Maybe it was something else, but I definitely remember something done with synthesizers that was a classical piece, and was very popular on the radio. I can’t find it anywhere except on Amazon for $100 for the CD. There’s a little snippet on the Wickipedia page. I used to have the album, it was very clean with a great vintage moog sound. Don’t know whatever happened to it. That’s part of my curiosity, kind of the “sociology of music”. This could be a great video series. Interview artists and fans of music from all kinds of eras and genres of music and try and see what makes everyone a fan. 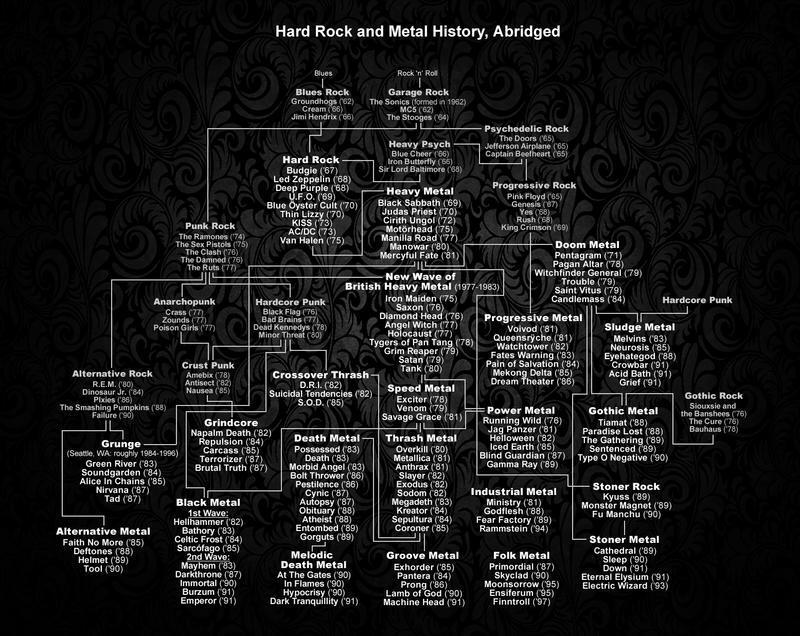 Sam Dunn did this with Metal and I really enjoyed it, he made a film about Metal Evolution and constructed a Metal Genealogy chart with dozens of sub-genres inspiring each other over time. He interviewed artists and I believe fans too, at least you see him mingling with fans at concerts and I think there were clips of fan statements. He went back to Pre-Metal and covered the whole history. It would be cool to do that with other genres too! Starting at 6:00 in this Sam gets a brain scan while listening to music. At 9:00 he starts the history with Black Sabbath in Birmingham, 1970. I watched that on VH1 Classic (I think) several years ago. Great documentary. Interestingly, all of those bands are still going and with the exception of Maiden we ‘know’ them all (to varying degrees) and we have played on the same stage as all of them within the last couple of years. We’re playing with Grim Reaper again in July. Bizarrely, Kerrang thought it appropriate to class Seattle-based Q5 (Of Floyd Rose fame) as NWOBHM too! They appeared in the ‘Armed and Ready’ section in the same issue that we did. We have also played on the same stage as Q5, most notably Headbanger’s Open Air (Germany), and we have come to know them very well. I remember you told a story about being neck-to-neck with Saxon back in the day, but they ended up getting the record deal (IIRC), so it certainly could have turned out differently with a twist of fate. we have played on the same stage as all of them within the last couple of years. Good to know that these bands, and the style of music, are still alive and kicking. I don’t think the U.S. can hold a candle to Europe in this regard, though I’d be happy to be corrected on that. Metal seems to have maintained a solid foothold everywhere except the U.S. It’s interesting, however, to see the resurgence of the NWOBHM style in the new breed of up-and-comers known as the NWOTHM (New Wave of Traditional Heavy Metal). In addition to the ‘new kids’ there are a ton of bands getting back in the game. Check out bands like Night Demon, Tokyo Blade, Night Mistress and Icarus Witch. I guess there is hope for the future. Ah, thanks, I was completely unaware of this. I see a YT channel called “NWOTHM Full Albums” that seems to be heading in that direction. To be fair we were nothing special back then. When we look back now we can see why we didn’t get a deal.